Commercial curcumin contains pure curcumin, demethoxycurcumin, and bisdemethoxycurcumin (77%, 17%, 3%, respectively) of which only demethoxycurcumin is soluble in water at 25οC [Figure 1]. However, when solubilized with heat, all three curcuminoids become solubilized. These results suggest that biological effects of curcumin rendered in humans or animals when administered in powder form are mainly due to demethoxycurcumin. 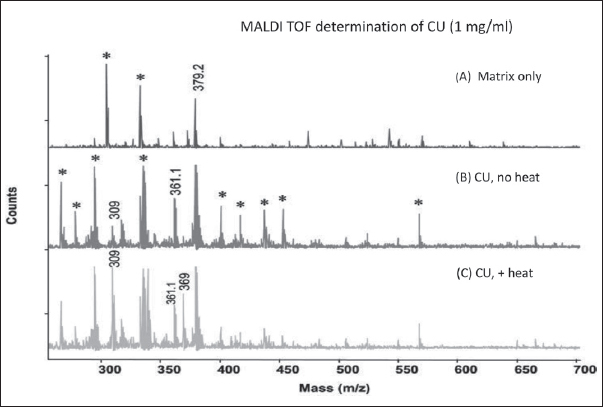 Figure 1: Curcumin (CU) solubility determined by matrix-assisted laser desorption/ionization time of flight mass spectrometry (MALDI-TOF-MS) after heat solubilization displaying masses from 250 to 700 (A) Mass spectra of only the matrix (α-cyano-4-hydroxycinnamic acid) (B) Mass spectra of curcumin preparation in water at 1 mg/ml obtained at room temperature (C) Mass spectra of curcumin preparation in water at 1 mg/ml obtained by heat treatment at 100°C for 10 min. The X-axis provides atomic weight values as mass divided by charge (z). Because the charge is 1, the mass remains unchanged for the values obtained. The Y-axis shows the number of ionized molecules. Asterisks indicate unassigned peaks. m/z 309, proton adduct of bisdemethoxycurcumin; m/z 361, sodium adduct of demethoxycurcumin; m/z 369, proton adduct of curcumin; m/z 379.2, α-cyano-4-hydroxycinnamic acid dimer (A) (Reproduced from Ref. 6 with permission from Mary Ann Liebert, Inc.). Greater than 40% of new chemical entities advanced by pharmaceutical companies display almost no solubility in aqueous solutions., Solubility is the most essential rate limiting step needed to bring about systemic levels required for pharmacological action in the case of drugs given orally. Lack of solubility has been cited as the main cause for new drugs not getting to the market or not attaining their full potential. Biopharmaceutical classification system (BCS) cites solubility as rate limiting step for oral absorption of BCS class 2 and class 4 drugs, which have low solubility. Consequently several methods have been employed to improve the solubility of water insoluble drugs [BCS classes II (low soluble and high permeable) and IV (low soluble and low permeable)].This includes methods like particle size reduction, solid dispersion, nanosuspension, supercritical fluid process, cryogenic techniques, inclusion complex formation-based techniques, micellar solubilization, hydrotrophy, crystal engineering, and cryogenic techniques. Curcumin can be classified as a BCS class IV molecule because of its poor solubility in aqueous solutions and meager intestinal permeability. Low water solubility and poor bioavailability of curcumin has been the bane of researchers working with this nutraceutical. Several methods have been used to improve solubility and bioavailability. However, even though curcumin has been described as being insoluble and not significantly bioavailable, over 5000 manuscripts have been published showing encouraging biological effects. Studies in humans have used curcumin powder as such, and studies in animals have mixed curcumin with animal feed or in oil. Since curcumin compound is not water soluble, we hypothesize that the observed biological effect comes from a curcuminoid that is soluble in water at room temperature. Commercial curcumin contains pure curcumin, demethoxycurcumin, and bisdemethoxycurcumin. We solubilized commercial curcumin at 1 mg/mL water at room temperature and analyzed the solubilized fraction employing matrix-assisted laser desorption/ionization time-of flight mass spectrometry. We found that curcumin compound was insoluble [Figure 1]b. Interestingly, demethoxycurcumin was the curcuminoid that was soluble in water at room temperature, followed by a small amount of bisdemthoxycurcumin [Figure 1]b. However, curcumin compound becomes solubilized in water by the application of heat [Figure 1]c (100οC). In addition, there was a significant increase in solubilization of bisdemethoxycurcumin by this procedure [Figure 1]c. However, there was no significant difference in the solubilization of demethoxycurcumin [Figure 1]c.
Commercial curcumin contains curcuminoids consisting of curcumin compound itself and its derivatives, i.e., demethoxycurcumin and bisdemethoxycurcumin, which structurally differ from each other by the presence and position of a methoxy group. Curcuminoid estimation has been carried out by several methods like thin-layer chromatography, high performance thin-layer chromatography, near infrared spectroscopic analysis, microemulsion electrokinetic chromatography, liquid chromatography-electrospray ionization-tandem mass spectrometry, capillary electrophoresis and supercritical fluid chromatography. Commercial curcumin dissolved in organic solvents and analyzed by these methods was shown to contain around 77% curcumin compound, 17% demethoxycurcumin, and 3% bisdemethoxycurcumin. Commercial curcumin solubilized in organic solvents, thus does not bring about differential solubility as obtained with water. Curcumin compound largely remains insoluble at room temperature when commercial curcumin preparation was solubilized at room temperature at 1 or 5 mg/mL. Since curcumin compound is not soluble in water at room temperature, we speculate that the biological effect observed in the studies that administer commercial curcumin in the powder form comes from mainly demethoxycurcumin, the major curcuminoid that first becomes soluble in water, followed by bisdemethoxycurcumin. Thus, we believe that the effects attributed to commercial curcumin in the literature, when given to experimental animals or human subjects is likely to be actually from demethoxycurcumin and bisdemethoxycurcumin and not significantly from curcumin compound. In order to obtain an effect from curcumin compound, it is essential to heat solubilize commercial curcumin or make the compound soluble in another manner. Differential effects have been observed when the various curcuminoids were studied following solubilization in organic solvents. Available data suggest that each individual curcuminoid affected important biological activities differentially. For example, curcumin compound, demethoxycurcumin and bisdemethoxycurcumin have been isolated from an organic extract of turmeric using silica gel 60 high performance liquid chromatography to yield fractions of curcumin compound, demethoxycurcumin, and bisdemethoxycurcumin with purity ranging from 95 to 99%. These authors found that at equimolar concentration, curcumin compound, demethoxycurcumin, and bisdemethoxycurcumin (solubilized in organic solvent) had similar antiproliferative activity against several cell lines. The suppression of nuclear factor kappa-light-chain-enhancer of activated B cells (NF-kB) activation was more active with the curcuminoid mixture than with the individual components. In addition, the authors showed that at equimolar levels all three curcuminoids brought about a similar increase in NF-kB induced increase in reduced glutathione levels. Recent data demonstrate that differential potency for inhibition of cancer cell invasion for the various curcuminoids was in the order of bisdemethoxycurcumin > demethoxycurcumin >curcumin compound, (when the curcumin preparation was dissolved in dimethyl sulfoxide). Enzymatic hydrolysis studies performed under various conditions demonstrated that curcumin compound and demethoxycurcumin are chemically less stable than bisdemethoxycurcumin, while the reductive metabolites of all three curcuminoids were found to be stable. Another recent study showed that in lipopolysaccharide-stimulated RAW264.7 macrophages, treatment with bisdemethoxycurcumin suppressed inducible nitric oxide synthase expression and nitric oxide production by down regulating NF-kB activity. Curcumin diacetate, a curcumin derivative, showed increased stability after being solubilized in organic solvents and diluted in water. The solubilized curcumin diacetate binds to human islet amyloid polypeptide hormone secreted from pancreatic β-cells and prevents the formation of the toxic oligomers formed during assembly of amyloid fibrils. Some investigators postulate such aggregates play an important role in diabetes mellitus or type 2 diabetes mellitus by destroying β-cells. (b) heat-solubilized curcumin inhibited 4-hydroxy-2-nonenal oxidation of a protein substrate by 80%, supporting the reported role of curcumin as an antioxidant,,, (c) heat-solubilized curcumin inhibited antibody-antigen interaction, (d) heat-solubilized curcumin could serve as a sensitive protein stain in SDS-PAGE gels, (e) heat/pressure (121°C) solubilized curcumin ameliorated lupus like disease in mice. In fact, very recent work has shown that commercial curcumin solubilized in water with heat ameliorated lupus like condition in MRL-lpr/lpr mice. The solubilized curcumin did not have deleterious side effects in these mice. It would be of interesting to study heat-solubilized curcumin in animals and humans for a variety of disorders. This work was supported by Grant # ARO7144, C3077004 to RHS and Oklahoma Center for the Advancement of Science and Technology Grant to RHS, HM and BTK. Zhitomirsky B, Assaraf YG. Lysosomes as mediators of drug resistance in cancer. Drug Resist Updat 2016;24:23-33. Varga ZV, Ferdinandy P, Liaudet L, Pacher P. Drug-induced mitochondrial dysfunction and cardiotoxicity. Am J Physiol Heart Circ Physiol 2015;309:H1453-67. Cosmai L, Gallieni M, Porta C. Renal toxicity of anticancer agents targeting HER2 and EGFR. J Nephrol 2015;28:647-57. Hartojo W, Silvers AL, Thomas DG, Seder CW, Lin L, Rao H. et al. Curcumin promotes apoptosis, increases chemosensitivity, and inhibits nuclear factor kappaB in esophageal adenocarcinoma. Transl Oncol 2010;3:99-108. Kurien BT, Singh A, Matsumoto H, Scofield RH. Improving the solubility and pharmacological efficacy of curcumin by heat treatment. Assay Drug Dev Technol 2007;5:567-76. Savjani KT, Gajjar AK, Savjani JK. Drug solubility: importance and enhancement techniques. ISRN Pharm 2012;2012:195727. Sareen S, Mathew G, Joseph L. Improvement in solubility of poor water-soluble drugs by solid dispersion. Int J Pharm Investig 2012;2:12-7. Wahlang B, Pawar YB, Bansal AK. Identification of permeability-related hurdles in oral delivery of curcumin using the Caco-2 cell model. Eur J Pharm Biopharm 2011;77:275-82. Paramasivam M, Poi R, Banerjee H, Bandyopadhyay A. High-performance thin layer chromatographic method for quantitative determination of curcuminoids in Curcuma longa germplasm. Food Chem 2009;113:640-44. Tanaka K, Kuba Y, Sasaki T, Hiwatashi F, Komatsu K. Quantitation of curcuminoidsin curcuma rhizome by near-infrared spectroscopic analysis. J Agric Food Chem 2008;56:8787-92. Nhujak T, Saisuwan W, Srisa-art M, Petsom A. Microemulsion electrokinetic chromatography for separation and analysis of curcuminoids in turmeric samples. J Sep Sci 2006;29:666-76. Jiang H, Somogyi A, Jacobsen NE, Timmermann BN, Gang D. Analysis of curcuminoids by positive and negative electrospray ionization and tandem mass spectrometry. Rapid Commun Mass Spectrom 2006;20:1001-12. Sanagi UKS, Marsin M, Ahmad RM. Application of supercritical fluid extraction and chromatography to the analysis of turmeric. J Chromatogr Sci 1993;31:20-5. Yodkeeree S, Chaiwangyen W, Garbisa S, Limtrakul P. Curcumin, demethoxycurcumin and bisdemethoxycurcumin differentially inhibit cancer cell invasion through the down-regulation of MMPs and uPA. J Nutr Biochem 2009;20:87-95. Hoehle SI, Pfeiffer E, Solyom AM, Metzler M. Metabolism of curcuminoids in tissue slices and subcellular fractions from rat liver. J Agric Food Chem 2006;54:756-64. Kim AN, Jeon WK, Lee JJ, Kim BC. Up-regulation of heme oxygenase-1 expression through CaMKII-ERK1/2-Nrf2 signaling mediates the anti-inflammatory effect of bis-demethoxycurcumin in LPS-stimulated macrophages. Free Radical Biol Med 2010;49:323-31. Pithadia AS, Bhunia A, Sribalan R, Padmini V, Fierke CA, Ramamoorthy A. Influence of a curcumin derivative on hIAPP aggregation in the absence and presence of lipid membranes. Chem Commun (Camb) 2016;52:942-45. Kurien BT, Scofield RH, In vitro modification of solid phase multiple antigenic peptides/autoantigens with 4-hydroxy-2-nonenal (HNE) provide ideal substrates for detection of anti-HNE antibodies and peptide antioxidants. J Immunol Methods 2005;303:66-75. Kurien BT, D'Souza A, Scofield RH, Heat-solubilized curry spice curcumin inhibits antibody-antigen interaction in in vitro studies: a possible therapy to alleviate autoimmune disorders. Mol Nutr Food Res 2010;54:1202-9. Kurien BT, Dorri Y, Scofield RH, Spicy SDS-PAGE gels: curcumin/turmeric as an environment-friendly protein stain. Methods Mol Biol 2012;869:567-78. Kurien BT, Harris VM, Quadri SM, Coutinho-de Souza P, Cavett J, Moyer A, et al. Significantly reduced lymphadenopathy, salivary gland infiltrates and proteinuria in MRL-lpr/lpr mice treated with ultrasoluble curcumin/turmeric: increased survival with curcumin treatment. Lupus Sci Med 2015;2:e000114.